As a hope for this blog, I would like to make sure I shared all my thoughts on recent things with you all, especially those that are just too great to pass up and not write about. I don't know if anybody would actually wear this craziness, but the food nails above are just hilarious to me. I mean, look at them. My mouth is already watering. It's got some pancakes (with syrup!) 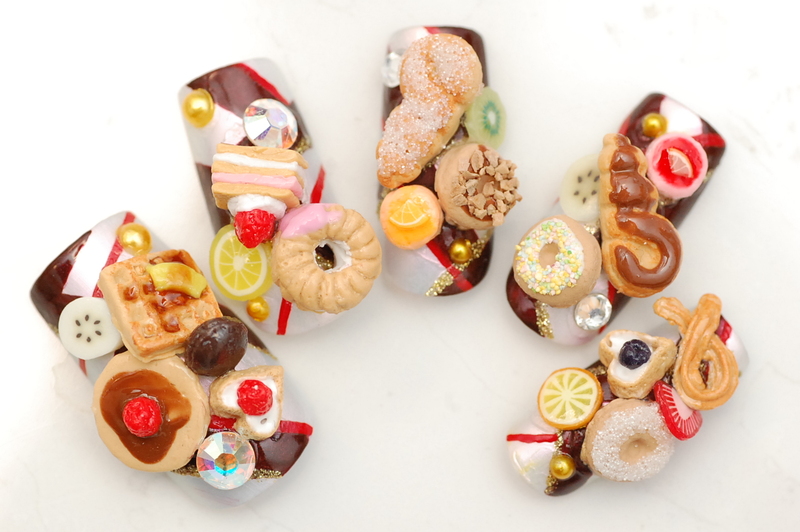 on the thumb, a waffle, an assortment of fruits, strawberry shortcake, a random churro on the pinky, a few donuts, some sugar-dusted pastry, and other delicious-looking sweets with icing on top. Basically covering all my essential food groups. 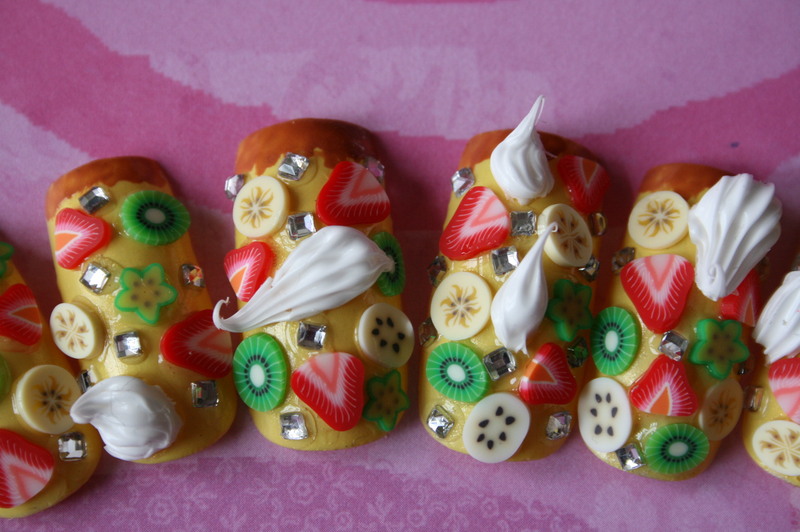 I found these outrageous nails on this blog, which I now absolutely love. Below are some more nails I want to eat. The whipped cream is ingenious. Probably not practical, but very fun to look at. ﻿I think one-pieces are a little over-looked these days. I found the vintage, retro-looking swimsuit below at urbanoutfitters.com and instantly thought of Katy Perry. Seeing girls wear one-pieces feels new even though it's not, because many girls don't choose to wear them anymore because they're "old-fashioned", you "don't tan properly", and/or you look like you're "on swim team". They're flattering on most body types, classier, and it's nice seeing girls be a little more modest these days. I just think it's important to keep them visually interesting with patterns, beading, cut-outs, etc. I love the one below with the dots, ruffles, and the instant hourglass shape. It's a 40's pin-up-inspired look on the more conservative side, but still fun. Below is a room that takes my breath away. The entire house is completely 1960's Cali vintage-glam gorgeous, but my favorite room in the house had to be the dining room. The lighting fixture is just so beautiful with the fun, silver reflective wallpaper. I loved all the sleek elements, like the chrome barstools, vase, and mirror with the fun pops of blue, and of course, that glitzed-out chandelier. The perfect combination of vintage and glam pieces. To view more pictures from the L.A. Times article on Lara Spencer's stunning home, click here.